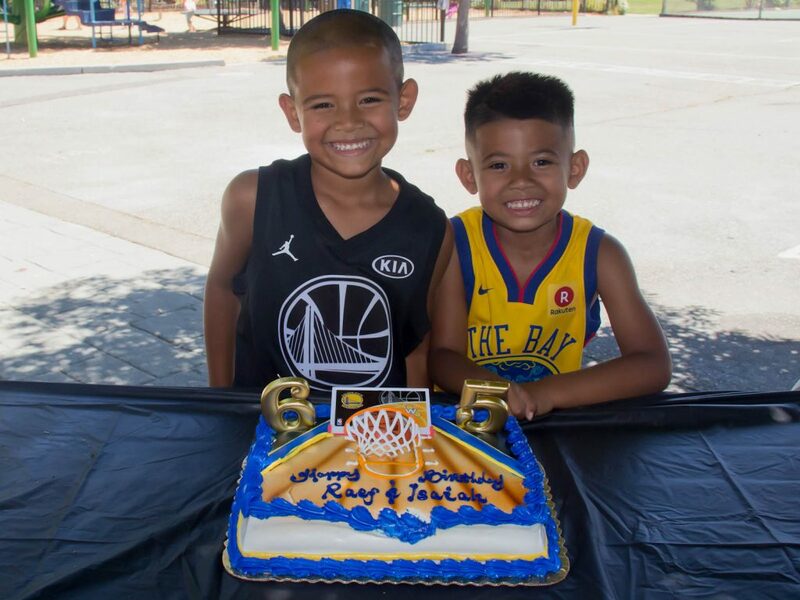 This year my boys turned 5 and 6…and for the past year they have been ALL about basketball, specifically our hometown Golden State Warriors who just happened to prevail as back to back champions in June. 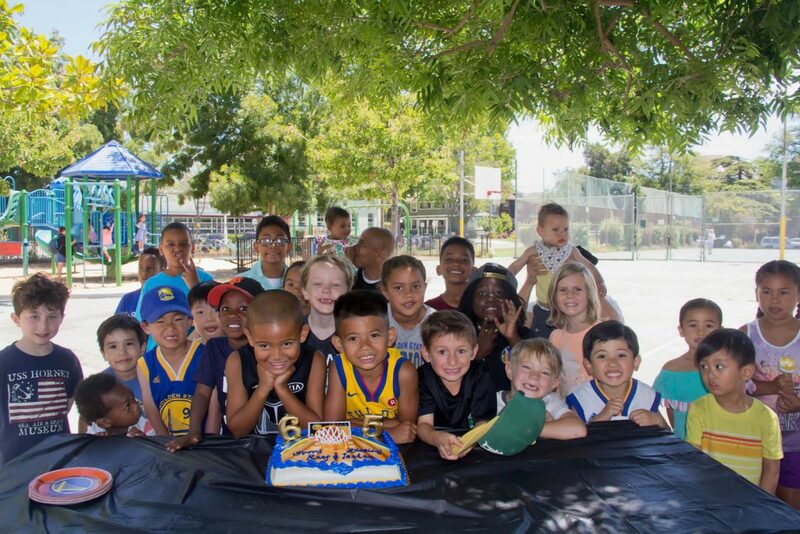 So, their birthday party these was a no brainer…a Dub Nation Birthday Celebration! 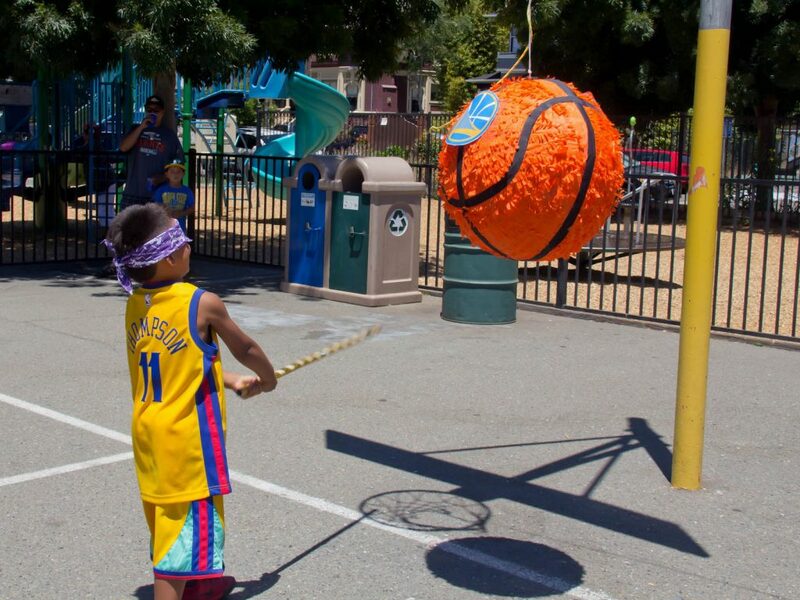 My boys have been spoiled when it comes to (NBA) basketball. Not only did both of their births coincide with NBA Championships (in Miami), but in both of their lifetime’s, they have only known living in places with NBA Champions! 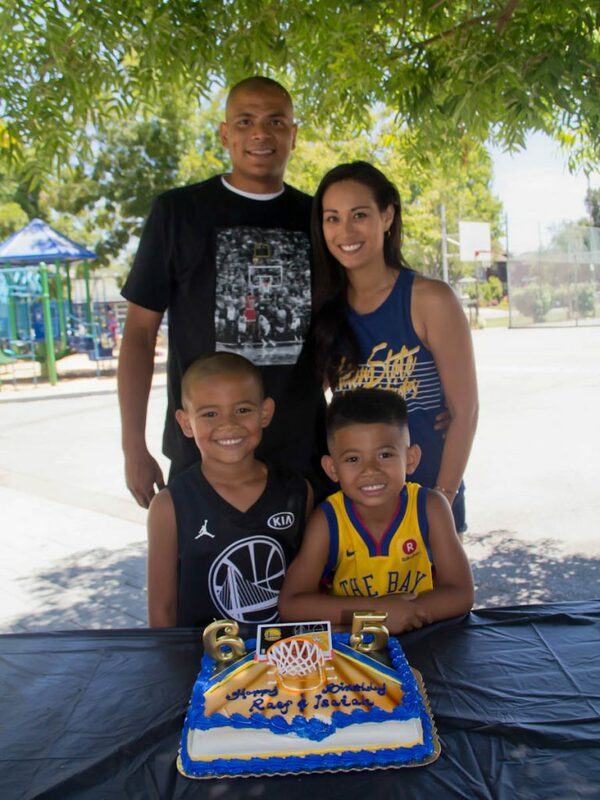 We are clearly a basketball family, so this year I got the wheels turning to play up a blue and gold theme fit for my basketball kings! I made a custom “ticket” invitation via Paperless Post to announce the event, you can see those details here. 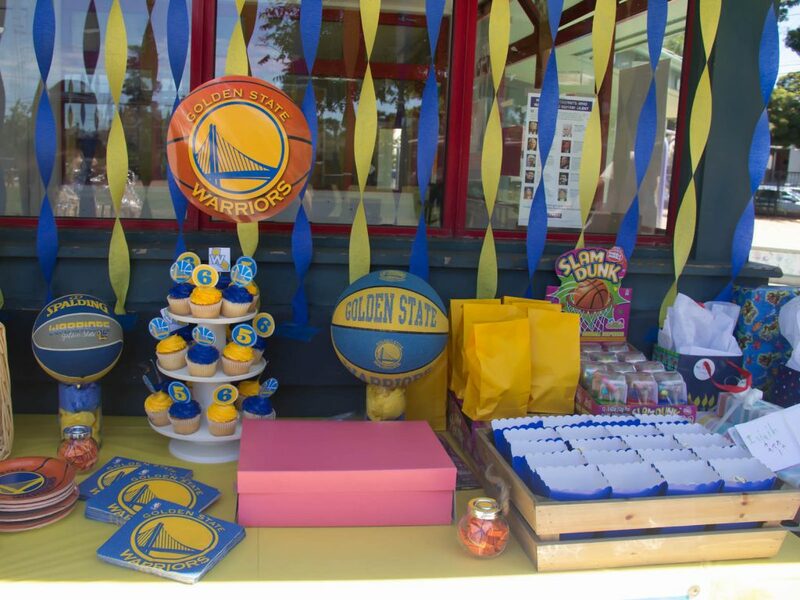 I created a dessert table using a backdrop of alternating blue and gold streamers, and I stuck a warriors sign from Party City in the middle. 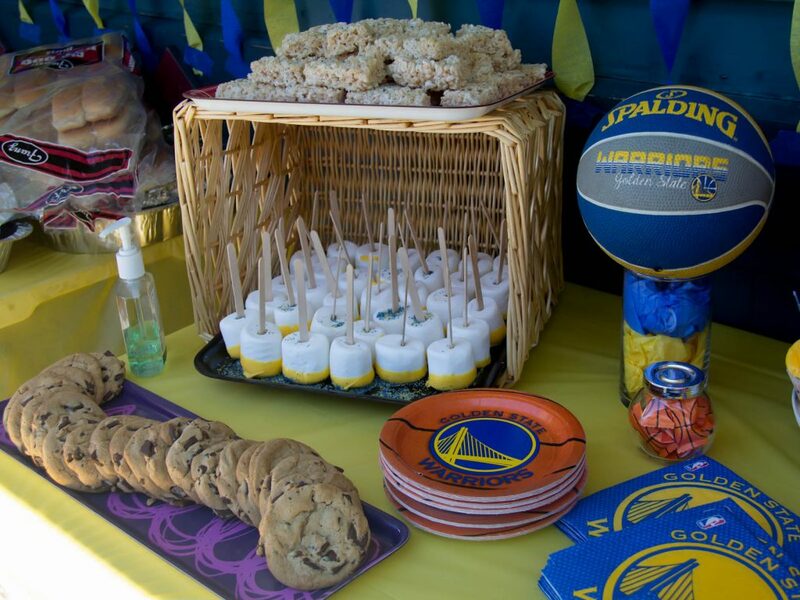 I covered the table with a coordinating yellow table cover and added Warriors logo plates and napkins. 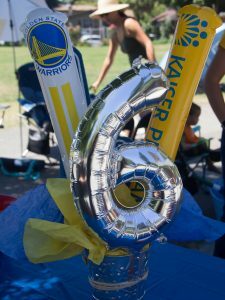 We already had a couple Warriors basketballs, so I propped them up on clear glass cylinders stuffed with matching tissue paper. 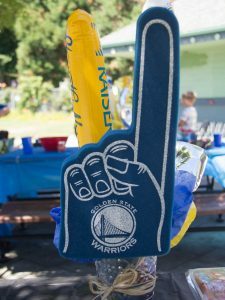 I got the Warriors themed sheet cake from Safeway and ordered blue and yellow frosted cupcakes. I topped the cupcakes with their age (5 & 6) numbers, along with team logos, that I sized and printed out myself, then glued onto toothpicks. I found mini blue popcorn boxes which I filled with Boom Chicka Pop Kettle Corn, and filled the small candy jars with basketball wrapped butter mints. 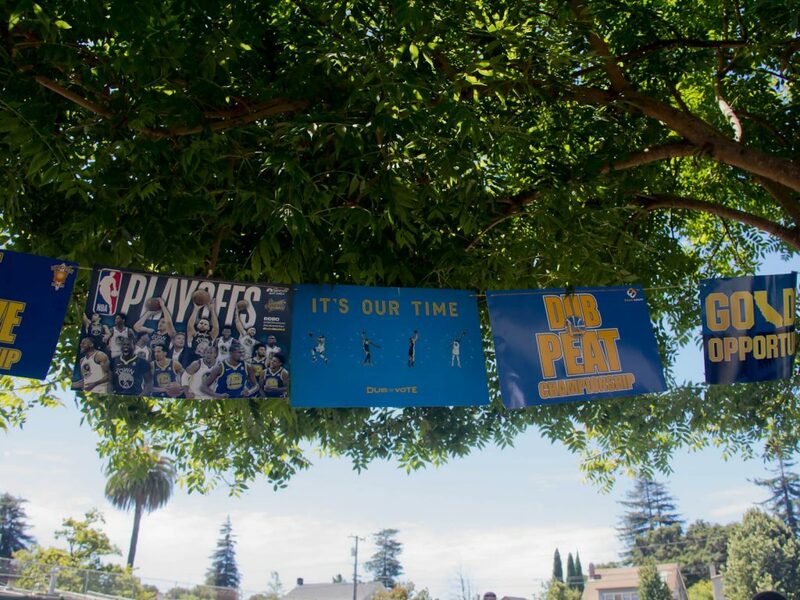 Over the years we’ve collected and saved various Warriors signs, so I thought, why no string them up and use them for decorations. That was really easy since we had several signs. I just punched holes in the corners and used twine to string them up. Since it was an outdoor party at the park, I just made a couple centerpieces (you never know how the wind will factor in). I took a couple metal pails and filled with rocks for weight – found these at Dollar Tree. 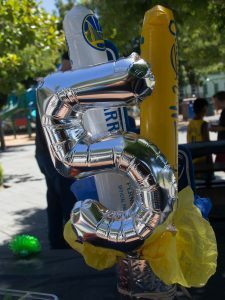 I then placed (free) foam fingers and clap sticks we’ve gotten from games, added tissue paper and stuck a “5” and “6” balloon to finish the look. 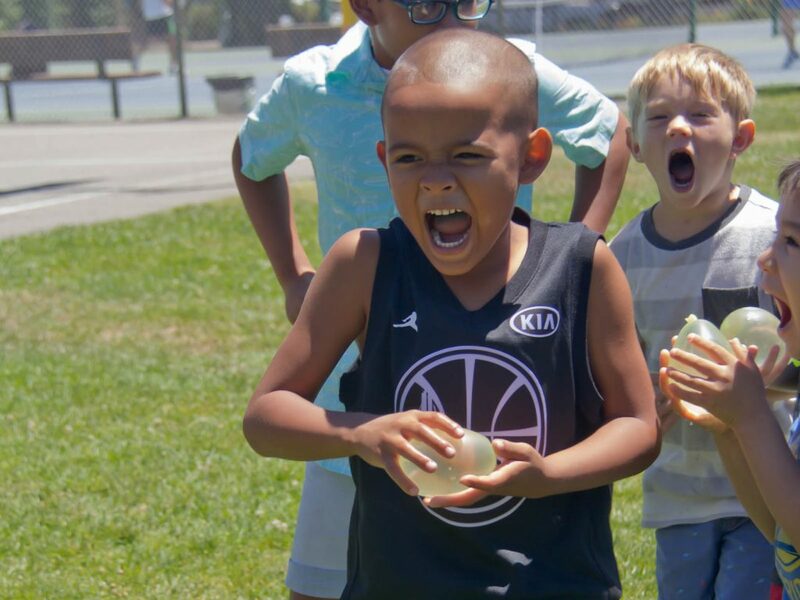 We played with water balloons…. You know it was a GREAT party when there was lots of laughter and smiles all around! 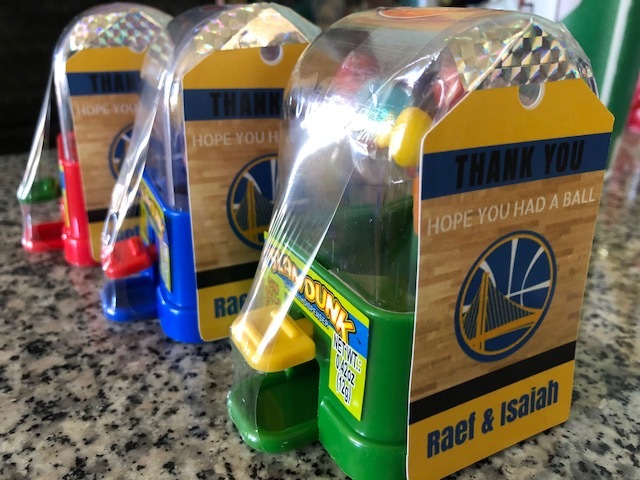 I also found the perfect thank you gift to give our guests, a Dubble Bubble “Slam Dunk” dispenser and I custom created a thank you tag to stick on them. Thanks to all our friends and family who celebrated our boys with us and made it a very memorable occasion!